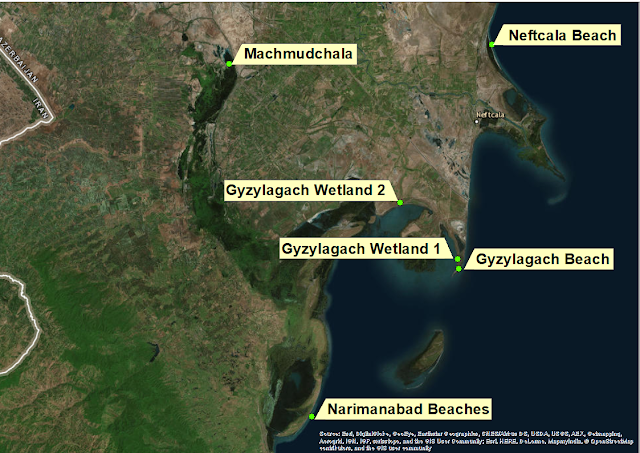 This blog post will introduce you to a research project about waders in the area of Gyzylagach (southeastern Azerbaijan). It gives you brief insights into the fieldwork and gives information about interesting sightings and numbers of waders. The journey began on 4 July when I arrived with my friend Stella in Baku. In the first days we were just birding for fun in Shirvan and Gobustan national park, Talysh mountains and Zuvand region. On 8 July Sönke arrived and the team was complete. Since then we started exploring potential sites for shorebird counts along the coast and also did some additional bush- and steppe birding to get some local breeding birds. We decided to count on three sites in the Gyzylagach area: a beach near Neftchala, Machmudchala wetland complex and the nearby fishponds and at the beaches of Narimanabad. the second Grey Phalarope for Azerbaijan and a sighting of a Pectoral Sandpiper. Unfortunately, the permission for trapping and tagging Black-tailed Godwits has not been granted so far but I will try to get the permission at least for the next year as long I am doing the fieldwork in Azerbaijan. Nevertheless, I am quite exited by what the next few weeks will bring to Gyzylagach and the nearby beaches. Many of these birds will over-winter with us in Tanzania and many more will be passage migrants. If you are fitting leg flags we have 40 or so birders who could be asked to look out for them. Good luck with permits and funding. Perhaps we could provide some hands on volunteers for 2018. Hi Neil. Would you email us on waderquest@gmail.com please. It would be extremely interesting to have people actively looking for the birds in the wintering quarters. We'll pass on your comments to Christoph. Good to know about your study but on the other hand, some case studies show that there are lot of species that are in danger to be ended soon so we need to work for them. Very true Charlotte, but then again experience has shown us that by neglecting so called common birds they can all too soon start to decline in numbers, observe the Eurasian Curlew, Norhtern Lapwing, Eurasian Oystercatcher and Red Knot as prime examples, and before you know it they become rare and in need of urgent attention. By understanding and protecting common birds and the environment in which they live we can very often also protect the less common ones and many other species and taxa at the same time.